to the face of adults as well as children. Indeed, family birthday parties often seem to ‘lack something’ if balloons aren’t involved, somewhere pinned up to ceilings and sitting room walls; declaring the age of the birthday-boy or girl. Old Wilf loves balloons too, although I have recently had reason to consider the impact that balloons have on our wildlife. Not the ones we put up in our sitting rooms for little Rosie’s 4th birthday party but the helium-filled type that are often released to commemorate weddings, remembrances, outdoor sporting events, opening ceremonies etc. Balloons are harmless, aren’t they? Many other facts about balloons can be found on the UK Marine Conservation Society website here. Of course we can. There is most definitely a time and place for using balloons. They can be used indoors, safely obviously, around children and animals. They can then be popped and disposed of correctly. 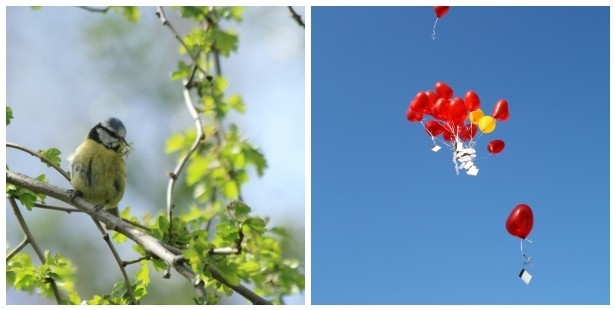 It really is a question of … do we want to release helium filled balloons into the skies and potentially harm birds, wildlife, sealife and other animals. This entry was posted in community, Wildlife and tagged animals, birdlife, conservation, environmental, parks, parks and green spaces, wildlife, wilf, wolverhampton, wolvesparkies. Bookmark the permalink. Thank you for the mention, and for bringing attention to this important issue – but, sadly, you have misunderstood. It’s supposedly biodegradable latex balloons which deteriorate more slowly in seawater, and that retain their elasticity even after 12 months (or more) of exposure. They’re still killers. No balloons, latex or otherwise, biodegradable or not, should be released. After all, you wouldn’t scatter burst balloons on the ground, or give them to a child to play with. Thank you for making this point clear. Sadly this just highlights the importance of this particular issue with regards to wildlife and your comments clarify the point. There are a number of ways that we can celebrate events that perhaps would’ve been noted using balloons. Some advocate the use of releasing butterflies … but that could be a whole different discussion. I think my personal preference would be to scatter indigenous wild-flower seeds, planting a tree or volunteering time to a cause close to my heart.